Retirements in the Texas congressional delegation created open seats in several staunchly conservative districts in the Lone Star State and one of the most important of these races is in Texas Congressional District 21, where Chip Roy, former Chief of Staff to Senator Ted Cruz is in the runoff to fill the seat of retiring Rep. Lamar Smith. That Chip Roy is THE principled limited government constitutional conservative in the race we can confirm from our many years of working with him, but Chip is, as Senator Cruz observed at a campaign rally, more than a conservative policy wonk – he’s a warrior and take-no-prisoners fighter for conservative principles. "I worked everyday side by side with Chip. I can tell you this — this man is a conservative in his bones," Cruz said. "And when it comes to who's going to have a backbone — those first couple of years, you remember some of the brutal, bloody fights we had. I can tell you Chip was there side by side, leading the fight." Roy, a cancer survivor, has made getting rid of Obamacare one of his key issues. In New Braunfels — and in a TV ad released a day later — Cruz argued "Obamacare is personal" for Roy, implying he has seen firsthand the problems with the health care system that both men believe stem from the Democrat-sponsored legislation that President Barack Obama signed in 2010. 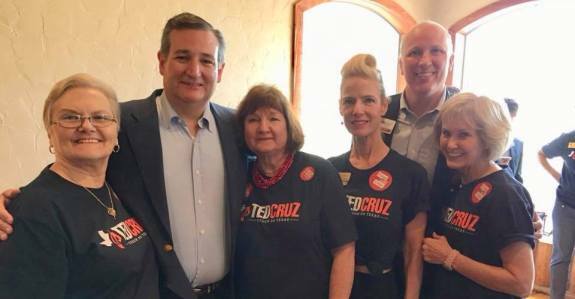 Roy is also benefiting from support from our friends at the Club for Growth’s super PAC, Club for Growth Action, that began airing a TV ad that features Cruz facing the camera, extolling Roy's conservative credentials. Click here to view the ad. Tea Party organization have also gotten behind Roy in a big way. Tea Party Express, the nation’s largest grassroots Tea Party political action committee, has also announced its endorsement of Chip Roy for Congress in Texas’ 21st Congressional District. Tea Party Express Co-Founder and Chief Strategist Sal Russo said, “While there are many good candidates in this race, Chip Roy stands out as the most experienced and most qualified candidate who will fight for our Tea Party message of limited government and fiscal responsibility in Washington, D.C. Having fought in the trenches alongside Tea Party champions like Senator Ted Cruz and Governor Rick Perry, Chip has a proven record of standing up for conservative principles. “Chip understands that limited government leads to more freedom and opportunity for the American people. Whether it is getting Washington out of our healthcare decisions, simplifying our onerous tax code, or empowering businesses to create jobs by slashing regulations, he will champion the cause of economic liberty and stand up for our God-given freedoms. “President Donald Trump and conservatives continue to get things done. The President has destroyed thousands of regulations that have hindered economic growth. With the pro-growth tax plan that was pushed through by conservatives in Congress, Americans get a well-deserved tax break and a job-creating tax bill. There is still plenty more to do – end the out-of-control spending, repeal Obamacare, and commit to reducing the size, cost, and intrusiveness of the federal government. Our best hope is to send more Tea Party conservatives like Chip Roy to Washington to finish the job,” Russo concluded. We urge our friends in Texas Congressional District 21 to turnout for the May 22 runoff and to vote for Chip Roy, the one candidate in the race who can be trusted to keep his promises once he gets to Washington. Click here to learn more about how you can help Chip's conservative campaign for Congress.